Howdy! Hope you all are doing well today. Today I wanted to share another card I made using my new PTI Polka Dot Basics II. This tag would also look great by itself. Just hang it from a ribbon tied to the handle of a kraft gift bag. I just might have to give that a try! Now that you know my favs, maybe you guys can share a little of what you love with me, if you would like. Well thank you for stopping in today!!! Hope I didn't bore you too much talking about my self. lol! Hope you liked the card! This was a good way to increase the number of cards in my stash. Anyways... 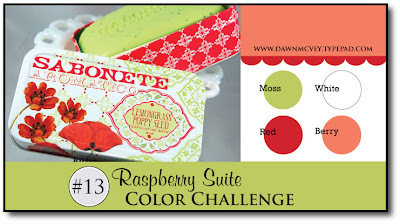 I hope you enjoyed my cards and thanks to Dawn for another fabulous Color Challenge! Accessories: Spring Moss & Berry Sorbet Vintage Buttons, Berry Sorbet GG Ribbon, twine, Circle Punch & Corner Rounder. I received my latest Papertrey Ink order yesterday. If you are not familiar with Papertrey you should check them out, they are an awesome company. I love getting new goodies, it doesn't happen often enough though! :) So today I played around with my new Background Basics: Retro stamp set. I have two cards to share with you today because I did some exploring and I kind of stepped out of my comfort zone. So you'll have to let me know what you think. For the first one I was going for more of a masculine look, which I am not very good at. I guess it could work for a kid card too. Its a little hard to tell in the photo, but there is a red edging on the right side of the blue strip. For this card I was kind of going for a retro and very simple look. So what do you think? Well its always fun to try something new and different! I don't do this very often but its a good way to experiment and grow. How about you give it a try too? Thanks for stopping by and hope you enjoyed. So Monday is the start of a new CAS Challenge. This weeks CAS challenge is a sketch based on this card by Krystie Lee. It's a very simple layout but for some reason it took me three tries to get it right. So this is the last card I made and the one I was most happy with. I started with the tree and I wanted add something to the tree that was simple and a little different. I would usually think to place rhinestones or buttons on the ends of the branches, but I wanted to go simpler this time. So I went with a single flower cut from the smallest blossom nestabilities (crinkled of course, I keep doing this for some reason it just adds a little extra) and a button. The green strip was a scrap piece I had laying around my work space. Then finished the card off with a sentiment, ribbon, and a corner rounder. This card totally reminds me of spring! Definitely was a fun challenge. Third times the charm I guess. I hope you enjoyed! Have a wonderful day!!! I've always enjoyed the Fall To Layout Sketch's on the Clean and Simple Stamping Blog. Most of them seem to fit my style. So this card is late, but here is what I came up with for FTL#50. The pink panel is stamped with text and the scalloped edge extends over the edge of the cardbase. The butterflies were randomly stamped, punched out and embellished with black rhinestones. My hubby brought these home for me on Friday, just because! He is such a Sweetheart!!! Well I hope you enjoyed my card and flowers and I do hope you will visit me again. Thanks to everyone who left me wonderful and welcoming comments for my first Blog Hop, I had a blast reading them all!!! Welcome!!! I am very excited to be participating in my very first Blog Hop!!! My blog is brand new (made my first post yesterday) so I hope I do this right. This months challenge for the PTI Blog Hop is to integrate Text into our creations. So here is what I came up with. I used BackgroundBasics: Text Style in versamark on kraft cardstock, then layered a flourish over the text. I created a neat ribbon detail by stitching over the ruffles. I thought this went well with the stitched button on the butterfly. Check out the butterfly, I gave him a quick crinkling to add a bit of texture. Isn't he cute! This was fun! I am already looking forward to next months Blog Hop. I hope you enjoyed my card and hope you will come back soon!!! Thanks For looking! Wow! So here it is, the blog I said I would never start. Thanks to the support from my husband and help from new online friends, I've decided to start a new adventure in blog land. I have no idea what I am doing, so please bear with me as I figure it all out. I've never thought of myself as a creative person until I started stamping and making cards. I'm looking forward to sharing my creations with you and meeting others who love this craft as much as I do. I plan to keep things short and sweet and I hope you enjoy!!! So onto the first card. I made this card a couple of days ago for the CAS24 Turquoise, Orange and Yellow Summer Challenge over at Splitcoaststampers.com. The original idea for this card was to add 3 rows of buttons, one in each color, but as I arranged them on the card I realized that would have been too busy. So I went with "Less is More" and randomly stitched them to the card. Thank you very much for stopping by, hope you come back soon!! !